Chair for office work at a computer. This example is limited to the geographical market for office chairs in Denmark. The market for office chairs is regionally segmented, which means that chairs sold in Europe are almost exclusively produced in Europe, with additional national sub- markets, so that the majority of chairs sold in Denmark are produced in Denmark. As regards the customer segment, the computer workstation chair is intended for the worker, who is primarily sitting, and who is working behind a visual display unit (VDU), e.g. a computer, for a significant part of the day (at least two hours a day). The functionality of this product appears to be decisive and no information was given that aesthetics, design and appearance of the product and the image (of the product or the producer) should influence consumer behaviour in the case of computer workstation chair. Five functional and technical properties were identified as obligatory for the computer workstation chair, namely: Adjustable seat height and adjustable seat inclination, adjustable backrest height, and adjustable back rest inclination, and availability of armrests. Some of these properties are targeted by specific legislative requirements. (Note that there are many other obligatory properties related to strength and safety that are general for all office chairs, and which are not specifically addressed here). 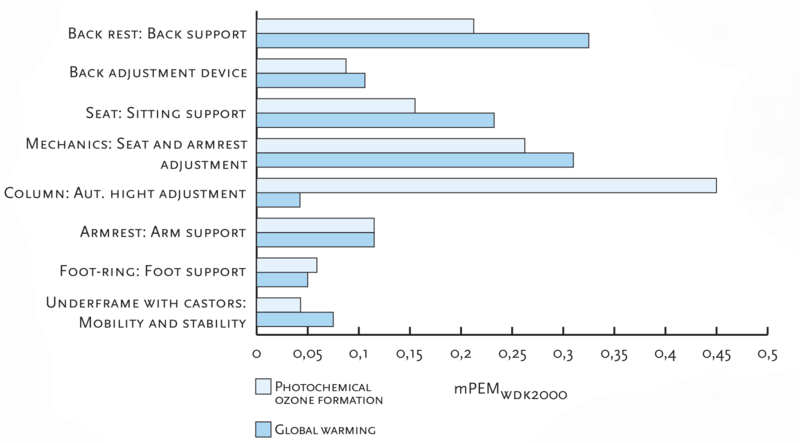 Figure: The link between eight functional properties and two selected environmental impacts, figure from Weidema et al. 2004. For computer workstation chairs, their durability is mostly taken for granted, i.e. a certain minimum lifetime (of 7-8 years) is implicitly considered an obligatory property. The actual difference in lifetime may vary, but does not play a role as a positioning property, since the chairs are often replaced for other reasons than technical failure (e.g. office refurbishment or technical developments). Of the functional and technical properties of the computer workstation chair, five properties were suggested by the study as the most important positioning properties, namely: Adjustability of the arm rests, roller brakes, and the possibility to chose between hard and soft rollers, adjustability of the angle between seat and back rest, adjustability of seat depth and the options to lock this, and finally the sophistication of chair movement. Regarding costs as a potential positioning property the study observes that it is normally assumed that the price is approximately the same for all the compared alternatives, so that the overall economy of the buyer is not affected. In Denmark, it may safely be assumed that this is the case, since the Danish Public Purchase Service (PPS) acts to stabilize the prices. No specific environmental properties were noted in the study. No differences in maintenance requirements were noted in the study. No adjustments in other office equipment were assumed to be necessary. Information on the main functional and technical qualities, as well as on market boundaries of the computer workstation chair, was obtained from marketing material. Another important source of information were the standards (ISO / CEN) for office chairs. The standards comprise both technical properties such as strength (e.g. ISO 7173), stability (e.g. ISO 7174-1), and safety (e.g. prEN 1335) and functional properties such as adjustments of seat height, depth and width, seat inclination, backrest height, width and inclination and arm rests length and width and more. On the Danish chair market there are two more important actors: the Danish Furnituremakers Quality Control and the Danish Public Purchase Service (PPS). Especially PPS play an important role on the market of office chairs, because public purchase has a very large market share, and in the general increase in customer requirements.